You task, should you accept it, is to build and fly a vehicle form the surface of Kerbin to Orbit using only rocket propulsion without jettisoning hardware carrying passenger. Entries will be ranked by cost per passenger with some bonus. No mods that add parts or change how the ship behave is allowed. Pure aesthetics and informational are allowed. Autopilot mods are allowed but see scoring below. Cheats and exploits are not allowed. This include clipping parts to improve performance. For the purpose of the challenge a passenger is not required at any point to control the vessel and requires a pressurized crew space (no command seats). Virtual passengers (aka empty crew spaces) can be used to fulfil the challenge. Only Liquid Fuel Engines and Solid Fuel Engines are allowed to propel the vehicle until orbit is reached. No Jets. No part can be jettisoned before the Craft reach an orbit with periapsis of 70.001m or higher. The craft cannot receive external help at any time. P +3 Hands on! For any entry that don't use an auto-pilot. A craft name (Untiltled Space Craft is not allowed) and a brief description. Calculated Score with mention of P and D bonus. Waiting gor yor attem´pt, I know you can make an intersting ship. Rocket McRocketface: Basically a passenger Airplane, but without wings and it's a rocket. It broke into pieces during reentry, but all 112 imaginary passengers survived the 36 m/s crash near the space center. Hands on: I used Mechjeb, but just for information. I also used Trajectories. Thank for the entry, @Physics Student. Feel free to reentry after solving the reentry issues. (pun attempted) I will gladly update the score. Notice that I'm rounding the score to the nearest integer in the leaderboard (at least until a tie occur) . At least is not like my demonstrator where one plane was destroyed (all 4 imaginary occupants miraculously survived without injury). Wait.... Is recovery cost counted? I might have to try something else out. I'll be back. "cheap and cheerful" threw out of the window but fun stayed inside. Answering your question recovery counts (unless you are aiming for the now what?!) However I'm the first to admit that the score matter less than making the entry interesting, (just look at my demonstrator). Your entry is a interesting one, regardless of score is not terrible. Expenses : 5233 credits for fuel and oxidizer. I see what you did, and had to say that name is just unacceptable. Well, I suppose, given the only name I prohibited, that become an irresistible choice. Cheap and fully recoverable is a good combination. /looking for the challenge rules explaining and enforcing "the cost of a less than 100% recovery" mandatory consideration and "landing right on the target". >Error 404, rules not found. 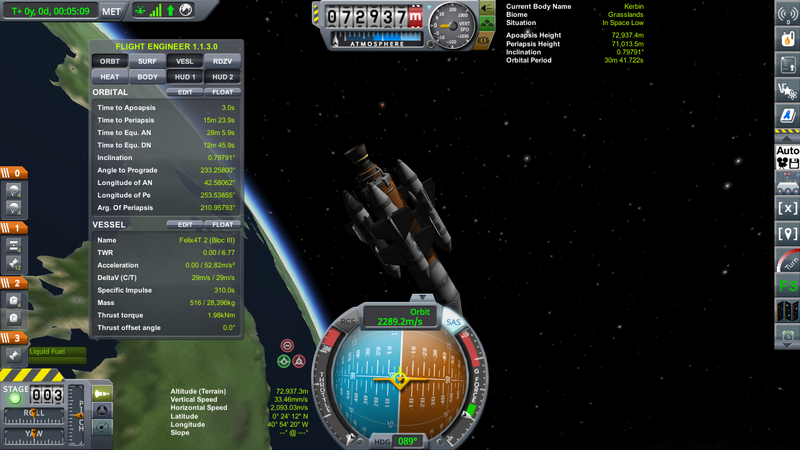 /using workaround : decoupling a solar panel after reaching orbit and defining Kerbin as "the target". >Error 426, rules upgrade required. /using workaround : going for the "C ya!" "Now what?!" "Hands on!" bonuses. Using the same space craft and accidentally jettisoning all fuel after reaching orbit. Score = (-[Cost/Passengers]*[100-P]*[100-D])/100 000 = (-[5233/16]*[100-3]*[100-6]/100 000 = -29.821. >Error 417, expectation failed. Should not get a better score for a lesser achievement. The "D" parameter should be a penalty, not a bonus. >Error 426, rules upgrade required (D +3 ---> D -3). >Error 429, too many requests. Uhhh, no. You misinterpreted the rules and I clarified it for you. I also think that is a pontual case and an update of the OP is not necessary. Cost is what VAB says. (e.g ) deduced what effectively recovered. You assumption of cost meaning fuel cost only is incorrect and need to be amended for your entry be properly ranked. Hey, those kerbals that bring the craft back to KSC also need snacks. Its a hard work t carry a heavy rocket in the back without drooping it and let it be damaged. I don't know why you supposed was ok to ignore that you actually paid for the parts, or else, why you assume 100% recovery of the parts when you didn't get it. In any case both the demonstrator and the entry by Physics Student acconted for the finalcial loss of imperfect recovery, qzgys used wing to land in the old airfield and get 100% recovery. If you thought is fair to let you use a personal definition of "cost" that cleary put you in advantage, think again. Score = (-[Cost/Passengers]*[100-P]*[100-D])/100 000 = (-[65800/16]*[100-3]*[100-6]/100 000 =-374.97775. I will even ignore that parachutes prevent the C ya! , for obvious reasons: 1. Removing it would not result in a lower base score. 2. Intended to change when/if you decide to comply with the request to retify the score calculation. You missed the point of those bonus. That is just my implementation of categories without the need of listing specific rules, keep separate leaderboard or even care if a particular category turn out to be unatractive. In this last case the category will be unpopulated and no one pay much atention to this fact, but if people find the idea instersting and go for it their effort will be recognized. My understood definition of cost was that as the space craft landed intact, with 100% of its paid parts, the cost of the mission was only fuel and oxidizer as the parts were recovered in full. Do you mean that my mistake was not taking a screenshot showing that I clicked the "Recover vessel" button once landed? Or is it because the space craft didn't land on a runway or a launch pad? Anyway, It may be that your rules aren't complete enough and don't quite follow the suggestion of the "what are we trying to do?" section of the challenge submission guide. Instead of insinuating things like my supposed unfairness, you should clarify what you mean by recovery, costs and a few other things too, so what happens here won't hopefully happen again to other contestants. Whatever. I'm happy my SSTO operated as designed and brought the crew back safely to Kerbin near KSC. Dismiss my entry if you want, no big deal. 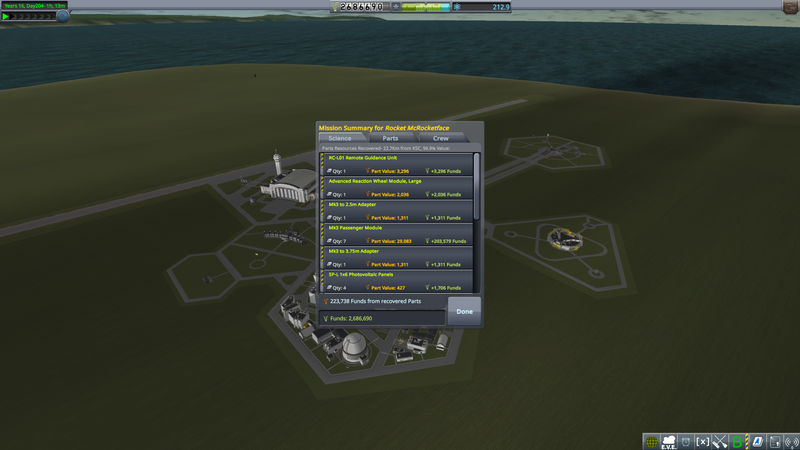 Simply subtract that from the overall cost in the VAB/SPH and you have an exact and unarguable number. That's true if you land on the runway. The further away you are from KSC, the greater is the recovery penalty. You can see the exact recovery value in the window that pops up after you recovered the vessel. Simply subtract that from the overall cost in the VAB/SPH and you have an exact and unarguable number. Whatever. I'm happy my SSTO operated as designed and brought the crew back safely to Kerbin near KSC. And I'm happy that you applied it to this challenge. Now I just need a rectified score to place your craft where it belongs in the leaderboard. As you may or may not had noticed, your entry was placed on the top of the leaderboard, waiting for the score. And I guess there was people wondering how to remove it from there (even with a score a few points worse), please don't make their job easier and less fun. That's true only if you land on the runway. Base score * (100-P)* (100+D) / 100000 ? It not only perform well, it also looks very nice. I really enjoyed the cabins in radial stacks around the big fuel tanks. 1 . Recovery will probably make much more difference that a meager 6% bonus. 2. You may look at the bonus not as a reward for doing something , but as an aid for people in trouble to make the craft recoverable. 3.There is cases where letting a spacecraft in orbit makes sense and returning it to the surface is the weird thing. 4. If you are wondering about the rules, maybe you are considering to participate. If a bit of weirdness helped to catch your interest, I suppose that is a good thing. Ok that's totally fine then and yeah I am considering making an entry but I am also tempted to play more RSS/RO I downloaded 2 days ago. Yesterday I got to the moon and back and now I'm planning a manned Mars mission already. It's like playing a brand new game! I strongly recommend it for anyone who is starting to get bored to the normal game (or is starting to think that normal KSP might be a little too easy/unrealistic).